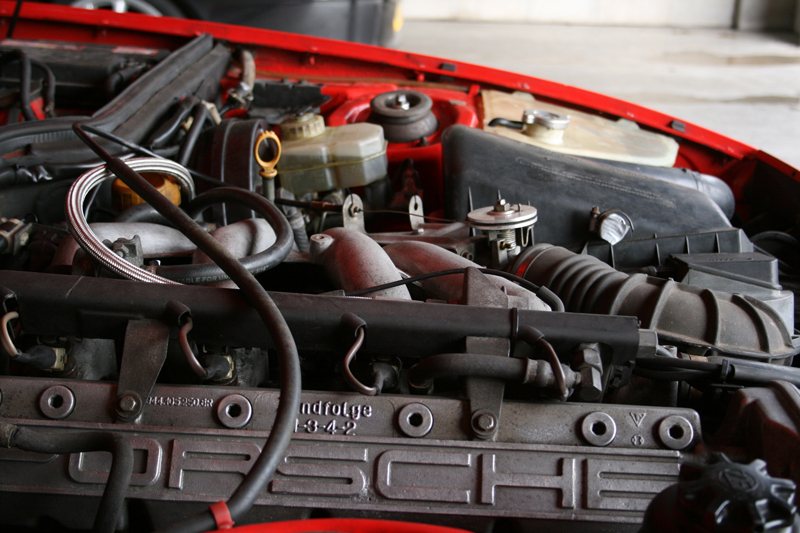 In January 2012 I removed the 924’s engine and spent some very cold evenings replacing the seals. 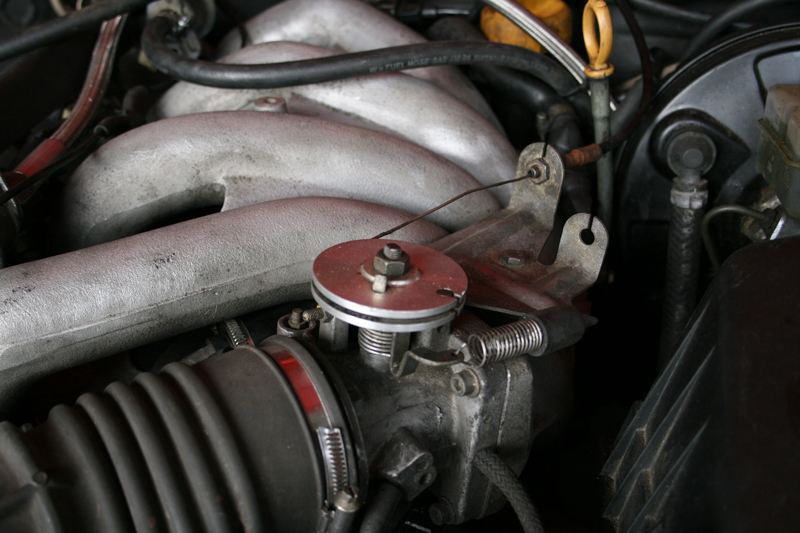 It was, without a doubt, the biggest mechanical job I’d undertaken so I was delighted that I actually did it right; it didn’t blow up and improved the car’s performance. A few months later I was driving to Bristol, coming off the M4 onto the M32 I slowed near the roundabout, saw a gap in the traffic and went for it. There was a Mini coming up fast so I kept my foot down. A hundred yards or so later I checked my rear view mirror to make sure the Mini wasn’t too close. The was no Mini in sight. Alarmingly I couldn’t see anything behind me, the rear screen was engulfed in smoke and when I looked down there was some in the cabin too. I made for the hard shoulder. Oddly, other than the smoke, there appeared to be nothing wrong. Proceeding gently I made it to my destination just fine. The following day more careful driving and got me home too. I took a few liberties with the revs when I got closer to home and nothing bad happened but I was still trying to calculate which of the engine’s internals had given up letting oil into the cylinder. The following day, in a moment of panic, I called a chap I’d bought a set of wheels off; he was breaking a 944 track car that someone had binned. I recall the engine looking good and was lucky enough to secure it for £300, including the DME. Collecting the engine it was as good as I remembered and while the DME was there, as promised, the wiring loom had been cut. My new engine was the 160bhp version, the same as in the later 924 S, and of course the loom was different from that of the 150bhp engine. I set the problem aside and continued to the use the car as it was. A week or so later there been no more smoke and I began to wonder if I had overreacted. Having time to reflect on what caused the car to go all James Bond my new theory was that I’d spilt oil on the engine and exhaust before heading west, but everything was fine while 70mph(ish) airflow kept the temperature down, only when I slowed for the roundabout did it heat enough to cause the oil to smoke and by the time I pulled onto the hard shoulder it burned itself out. It’s a theory. Months later on the GT Porsche track day at Brands Hatch the car was going well but making a hell of a racket at high revs – most noticeable at full throttle for the length of the pit straight. The sound was like pneumatic hammers pounding away at the engine block. Most likely a worn balance shaft, when I originally worked on the engine there was so much to deal with I hadn’t appreciated this was a problem. I decided it would be best if I fitted the new engine – despite never having see it running! First, I needed that new wiring loom. The main difference between the 150bhp and 160bhp engine looms is the additional connector for the sensor in the intake manifold that is not on the earlier engines. The 16v engines have a different loom again, this is identified by the connector on the bulkhead. A word of warning if you are going to attempt and engine swap, get the loom thrown in with the engine – the trouble it takes to remove them most breakers just cut them at the bulkhead making them hard to source. Having taken the engine out in January the second time around it was an easier process. The new engine fit took a little longer than I had hoped as I decided to swap most of the ancillaries (fuel rail, injectors, etc) once it was in situ. The final task I had not considered was fitting a thermostat. The previous owner had removed this, I suspect because it was only use as a track car and with the thermostat effectively permanently open the engine would stay cooler. That’s fine on track but using the car on the road where it won’t be run at high revs all the time I need the thermostat to close to help the engine get up to operating temperature. With everything in place there was one final task, a modification to a wiring connector, a breakout from the DME; there is an 8 pin connector on the new loom, but only a 4 pin on the one at the dash. I was concerned that this may cause running problems, it took about 24 hours for me to remember that I had the newer loom in the other 924 S so I simply unplugged that cable and checked the engine would start. It did. I then went through the wiring diagrams and worked out where I needed to match up the wires from the old and new looms. Spade connectors and a little soldering made light work of it; two of the cables controlled the rev counter, the others weren’t too important. Once the fluids were added I fired up the engine which started as soon as the fuel system had pressurised. After allowing it to idle for a little while I gave the car some revs and it was noticeably smoother than the old engine. Taking the car for a test drive the engine was definitely a good one, if a little rough at first, bedding back in I guess. The one oddity was the rounded throttle cam, this improves the throttle response by making it completely linear but initially it felt like it was just there to make it seem as if can’t drive at low speeds. A day after the engine was fitted I was off to a track day for the real test. It went well! 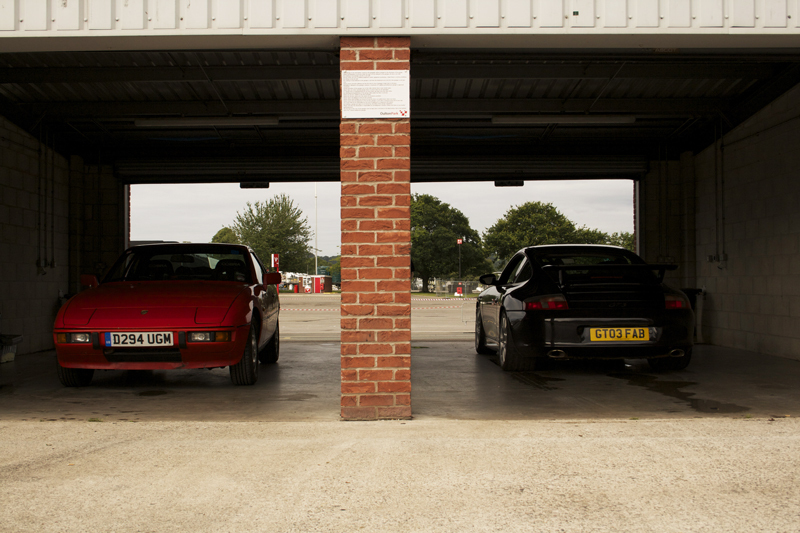 « 2013 with the 924 S, The Movie. Good to see you are still having fun with this Matt. Thanks mate, it is a huge amount of fun! I am way behind on the updates but it’s great and getting a lot of track time. Will try and get up to date soon. Hope you’re still enjoying the M!